Luxembourg began as a stronghold known as Lucilinburhuc. Initially part of the Frankish empire and then the Middle Frankish kingdom of Lothar I, it passed to Lothar II in 855 as part of the kingdom of Lotharingia. This gradually broke up, with the Luxembourg region being inherited by the duchy of Lorraine (in the Lower Lorraine region). A town grew up around the stronghold (which today is Luxembourg Castle). The territory quickly grew in stature which was gained by Sigfried, count of Ardennes in 963. This formed a useful buffer against the Western Franks. Bishop Willibrord of Utrecht in Frisia is given land by the mayor of the palace, Pepin II of Herstal, at Echternach, at which he founds a monastery to act as his new base. He is ultimately buried there, in the tenth century crypt of the church that bears his name. The territory is within the Frankish empire, but it ultimately forms part of Luxemburg. With the accession of the Saxon king, Otto I, the power of the Germanic Roman empire is confirmed. Otto is quite vigorous in establishing new counties and border areas within and without the empire's borders. The county of Ardennes under Sigfried gains the stronghold of Lucilinburhuc, Arnulf I the Elder is restored in Flanders, and the March of Austria is formed (or confirmed) from territory already captured from Hungary (around 960). Count of Ardennes. Dau m HRE Henry II. Henry V, duke of Bavaria. With the death of Holy Roman Emperor Henry II, the empire is administered by his widow, Cunigunde of Luxemburg. She has long been politically active at Henry's side and now, with the assistance of her brothers, Dietrich and Heinrich, she manages the regency period for about two months until the vacancy on the throne is filled by Conrad the Salian. Cunigunde hands over the imperial jewels to Conrad as a symbol of her legitimacy in office before retiring to Kaufungen Abbey, which she had previously founded in Hesse. Henry VII, duke of Bavaria. Upon the death of Giselbert, his son Conrad succeeds him as the first confirmed count of Luxemburg, taking it permanently out of the direct control of Lorraine's dukes. The stronghold of Lucilinburhuc was obtained by the count of Ardennes in 963. A town had already grown up around the stronghold (today's Luxembourg Castle), The territory quickly grew in stature to become a full county under Conrad I, and a duchy in the fourteenth century. Son of Giselbert. First count of Luxembourg. The margraviate of Baden is formed in eastern central Swabia during the general political collapse in Germany which dominates this century. The rebellion of Rudolf of Rheinfelden becomes known as the Great Saxon Revolt, with him being succeeded in his opposition against Emperor Henry IV by Berthold I of Rheinfelden, Hermann of Luxemburg, and Conrad of Franconia. Husband. Count of Bar (1190-1214). Having gained lands in Luxemburg as a result of his marriage to Ermesinde of Namur, Count Theobald I of Bar is now also granted the county of Vaudémont by Simon II, duke of Lorraine. Ferry II of Lorraine goes to war against his father-in-law, Theobald of Bar. He is defeated and captured and is imprisoned for seven months. In order to obtain his freedom he is forced to hand over Amance, Longwy, and Stenay, lands which he had gained thanks to his marriage to Agnes of Bar. Essentially, Theobald wins back his daughter's dowry. Second husband. Duke of Limberg. Holy Roman Emperor Charles IV and Archduke Rudolph IV of Austria agree a contract of inheritance which sets up the principle of mutual inheritance between the Habsburgs and the Luxemburg counts. Wenceslas dies without an heir. Brabant reverts to his wife's family. The duchy of Luxembourg reverts to his nephew, Wenceslas II. Wenceslas IV, king of Bohemia. HRE Wenzel (1378-1400). Luxembourg remains unsettled. Wenceslas II, in need of money, offers Luxembourg as a pawn for the repayment of a substantial loan. Luxembourg falls under the control of various creditors in turn, ending up under the rule of Wenceslas' niece, Elizabeth of Göerlitz. Relative of the duke of Burgundy. Sigismund, brother of Wenceslas I and his successor as Holy Roman Emperor, is unable to repay the outstanding loan, so he leaves his niece, Elizabeth of Göerlitz, in control of the duchy. Elizabeth elects to sell the duchy to Phillip the Good of Burgundy, who is also the count of Holland. Luxembourg is gained by the duchy of Burgundy through conquest. Elizabeth is paid off by Philip the Good of Burgundy the following year. Duke of Burgundy (1419-1467). Also count of Holland. Son. Duke of Burgundy & count of Holland. Duke René of Lorraine is facing increasing pressure both from Louis XI of France and Charles the Bold of Burgundy. He has already allied himself with Charles, but Burgundian garrisons have been established in Lorraine so René now switches allegiance to Louis. Charles invades Lorraine, forcing René to abandon Nancy on 30 November 1475. The city is recaptured on 5 October 1476 before René leads an army of Swiss mercenaries into the Battle of Nancy on 5 January 1477. Charles is defeated and killed, ending the Burgundian Wars. His death also ends Burgundian greatness. The lion's share of his domains are immediately annexed by Louis XI, while the sole heiress of Burgundy, Mary, marries Maximilian of Austria, future Holy Roman emperor. Dau. Heiress of Burgundy & Holland. When the duchy of Burgundy reverts to the French crown, Luxembourg passes to the Austrian Habsburgs, and then onto the king of the Netherlands at the end of the Napoleonic Wars. René II of Guise, duke of Lorraine, conquers the prévôté of Virton, part of Luxembourg lands, and annexes it to the duchy of Bar which he also holds. 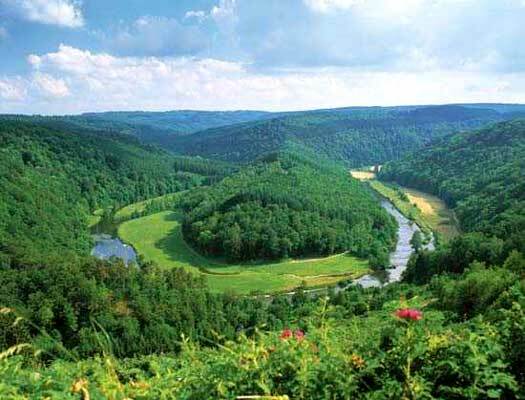 The modern grand duchy of Luxembourg is a land-locked country in Western Europe. Its territory is small, amounting to no more than 2,586.4 kilometres squared (998.6 square miles). 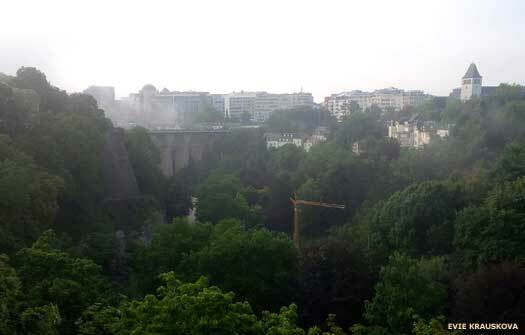 It grew up focused on its eponymous capital city (which is sometimes shown as Luxemburg City, or the City of Luxembourg, using the German and French spellings respectively). The duchy is bordered to the south by France, to the north and west by Belgium, and along its entire eastern border by Germany. The grand duchy began as a stronghold known as Lucilinburhuc which was part of the duchy of Lorraine (in the Lower Lorraine region), a Frankish territory which had been created by the break-up of the Frankish empire. 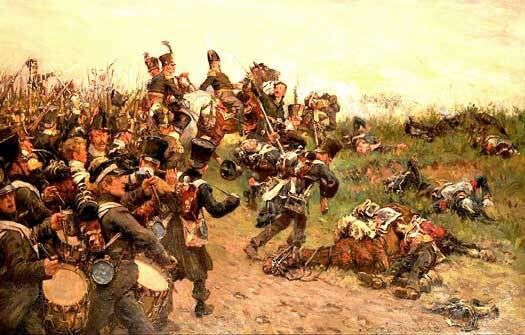 Then it was obtained by the count of Ardennes. A town grew up around the stronghold (which today is Luxembourg Castle). The territory quickly grew in stature to become a full county in the eleventh century, and a duchy in the fourteenth century. In the fifteenth century it was gained by the duchy of Burgundy, and then the Austrian Habsburgs in 1482. Recreation as a semi-autonomous state took place in the wake of the Napoleonic Wars against imperial France. Under the terms of the Treaty of Paris it was passed to the king of the Netherlands, and in 1890 it gained full independence. Today the grand duchy is a prominent financial centre, with residents who are largely proficient in three languages, French, German and 'Luxembourgish', a dialect of German. Of those residents, roughly a third are non-natives, drawn in by the high standard of living and the presence of a large number of multi-national businesses that have a base there. The duchy's wealth was built on the back of a once-flourishing steel manufacturing industry, although this declined towards the end of the twentieth century, prompting the switch to diversification and financial investment activities. Governor (provisionally until 29 May 1817). King of the Netherlands. Abdicated. Belgium splits from Dutch rule and the following year proclaims its own kingdom. The country shortens its name to 'Kingdom of the Netherlands', although the king remains monarch of Luxembourg. In 1839 he also becomes duke of Limberg. At the same time, Luxembourg's long-standing governor, Jean Georges O V M Zacharie Willmar, is succeeded by a governor-general. Grand duke of Saxe-Weimar-Eisenach. Governor-gen (Mar-May). Head of the government commission. Head of the civil administration. King of the Netherlands. Duke of Limberg. Son of William II of the Netherlands. Governor. The major constitutional changes introduced by William III in 1856 are now reversed with the promulgation of a new constitution. Some of William's changes, however, survive to the present day, including the creation of the Council of State. Son of William, titular duke of Nassau. Son. Titular duke of Nassau. William's uncle, Prince Nikolaus-Wilhelm, dies in 1905. This leaves William's cousin, Georg Nikolaus, count of Merenberg, as the only surviving legitimate male in the House of Nassau-Weilburg apart from William himself. However, he is the product of a morganatic marriage. In 1907, William declares the counts of Merenberg to be non-dynastic and therefore ineligible to succeed him. Instead he names as heiress-presumptive his own eldest daughter, Marie-Adélaïde. The late Adolphe's sister is Sophia of Nassau, wife to King Oscar II of Sweden. With the death of her husband, her eldest son, Gustavus V ascends the Swedish throne. He eventually gains the record of being the country's second-longest reigning monarch, and its oldest monarch in terms of his age. Dau. Accused of being pro-German. Forced to abdicate. Died 1924. The German empire moves swiftly to support its ally, Austria-Hungary, in a long-anticipated Great War (later more readily known as the First World War, or World War I). In the west, Germany's armies reach the northern outskirts of Paris before they are stopped by the armies of Britain and France, together with the small Belgian army. However, Luxembourg remains occupied for the duration of the war, and Marie-Adélaïde is perceived to be a tacit supporter. The populace grow increasingly unhappy with her, as do France and Belgium, and she is eventually persuaded by parliament to abdicate in favour of her sister. Sister. Abdicated. Died 1985. In exile 1940-1944. Attempts to escape German influence leads the duchy into an economic union with Belgium. Between the wars, Charlotte also sells the family's properties in Germany, including its hereditary seat in Nassau. Following its release from renewed German occupation during the Second World War, Luxembourg abandons its neutrality and becomes a front-rank enthusiast for international co-operation. Charlotte returns from four years of self-imposed exile in Britain and Canada after having refused to serve as head of state under German supervision. In 1948 Luxembourg furthers its attempts to encourage a more unified Europe by becoming a founder member of a customs union with Belgium and the Netherlands. Luxembourg continues its enthusiasm for greater European integration by standing as a founder member of the European Economic Community, a forerunner of the European Union. Son. Born 1921. Abdicated. Died 23 April 2019. Grand Duke Jean's eldest son and heir, Henri marries Maria-Theresa Mestre. In response, Carlos Hugo, dispossessed hereditary duke of Parma (with strong connections to the Bourbons of Spain) rules that the marriage is unequal. In 1986 Jean issues a decree that renounces the titles of the House of Bourbon-Parma for himself and his family. Son. Cousin of King Phillippe of the Belgians. 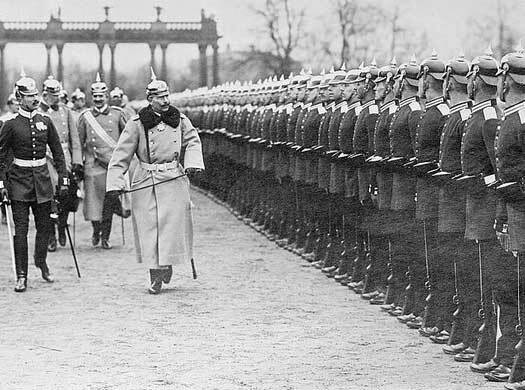 Grand Duke Henri announces that his conscience will not allow him to sign into law a bill that approves euthanasia. The crisis is resolved by means of a constitutional reform which removes the need for laws to be approved by the head of state, thereby reducing the post to a largely ceremonial role. In June, the right to reign over the grand duchy by right of agnatic primogeniture is dropped in favour of absolute primogeniture. This permits any legitimate female descendants within the House of Nassau to be included in the line of succession.